Gold consolidated above $1,730 an ounce in afternoon trade on Friday capping a week that saw the precious metal rise 3.5% in value to reach a three-week high. Gold's reputation as a safe haven asset was burnished this week as riskier investments like stocks – the Dow Jones plunged more than 400 points over two days – take a beating post the Obama victory in the US presidential race. The precious metal is being boosted by the prospect of continued highly-accommodative US monetary policy under US Fed chairman Ben Bernanke. Keeping markets fed with easy money through open-ended quantitative easing program adds to gold's allure as an inflation hedge and storer of wealth amid currency depreciation. What makes gold's weekly performance even more impressive is that the yellow metal's gains were in the teeth of a stronger dollar – gold usually moves in the opposite direction to the currency. Gold exchange traded funds saw their physical holdings surge this week to a new record high of 2,596 tonnes and BullionVault quotes a note from Commerzbank saying "inflows totaled 10.5 tonnes in the past three days alone." Rumours are also circulating that the 1.7% jump in the price on election day was as a result of a large gold purchase by a fund of billionaire George Soros, a political backer of Obama. Bloomberg reports traders are at their most bullish since August – 25 of 33 analysts polled say they expect the price of the metal to rise next week. “Now, with the certainty of the election results and four years of economic and monetary policy similar to the past four, higher gold prices seem both inevitable and imminent. Another issue counting in the gold price's favour over the near term is renewed worries in financial markets over the looming "fiscal cliff" in the US in January when more than $600 billion worth of spending cuts and tax increases are triggered. Economists worry that it would put the country's economy in danger of sliding back into severe recession with an IMF report suggesting that as much as 4% could be shaven off US GDP growth. 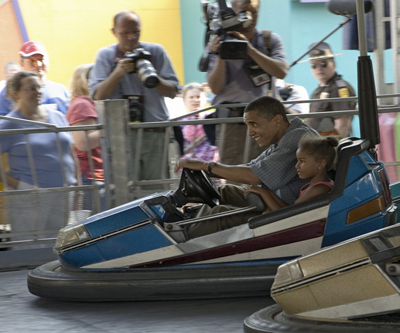 Image of then senator Obama driving a bumper car with his daughter while campaigning at the Iowa State Fair in Des Moines August, 2007 by spirit of america / Shutterstock.com.